Millipedes are brownish to reddish in color with an elongated cylindrical body. Millipedes have 40 to 750 legs and range in size between 2mm to 35mm. The millipedes appearance can also vary greatly, some having a hard exoskeleton or others soft furry bristles. Millipedes dwell in almost every environment known on the planet. 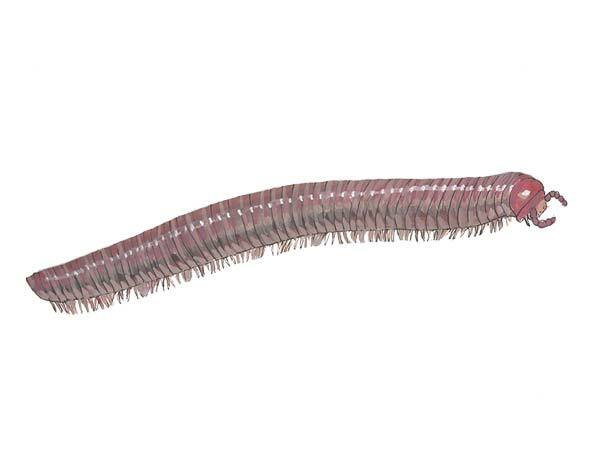 Some millipedes are found in caves, deserts and even some artic areas of Iceland. Most millipedes prefer to live beneath the soil in forests with high humidity. Millipedes can lay 10 to 300 eggs at a time. Some millipedes deposit their eggs in the soil and others build protective nests with cocoons. Some females will care for the eggs until they hatch and others will lay the eggs without returning. Juvenile millipedes hatch within a few weeks. The young millipedes will molt as they continue to grow into the final adult stage. Millipedes vary greatly in life expectancy, some living as little as one year and others to as long as 10 years. Most millipedes are omnivores, consuming both plant and animal based foods. The majority of millipedes prefer to eat decaying plants such as leaves from trees and plants. Millipedes are believed to be responsible for consuming up to 10% of the leaf litter around the globe. Some millipedes are herbivorous and feed on living plants, algae and fungi. A very small percentage of millipedes are carnivorous and feed on insects such as worms, centipedes and snails. Use caulk to fill in every single crack, crevice or hole on the exterior and interior of the home. Millipedes can crawl through the smallest openings so be sure to take your time and use a flashlight to spot possible openings. Install door sweeps on every door including screen doors on a lanai, porch or pool area. It is best to dry out the house as much as possible. Millipedes require a high moisture content to survive. Millipedes will quickly perish if the environment is too dry. Thoroughly ventilate washing rooms and bathrooms to reduce moisture buildup. Use dehumidifiers and run ceiling fans if possible. Fix any leaky plumbing and inspect areas where moisture tends to accumulate. Clean gutters so that they can drain properly. Remove firewood close to the home and store off the ground. Discard lawn trimmings and other organic debris. Water the lawn in morning allowing the ground to dry out from the sun. Refrain from over mulching flower beds. If these steps do not reduce the millipede population, residual pesticides may be necessary. Liquid insecticides containing pyrethroids are effective with millipede control and should be applied both inside and outside the homes perimeter by a licensed pest control technician. If an infestation is severe, the lawn may also require treatment. We solve pest problems, including millipede pest control everyday. We provide efficient and cost-effective service for customers in Sarasota and Manatee Counties. Millipede control made easy with Cloud Termite and Pest Control. We service Parrish millipede control, Anna Maria millipede control, Holmes Beach millipede control, Palmetto millipede control and surrounding areas.